Hi folks, Doc here. 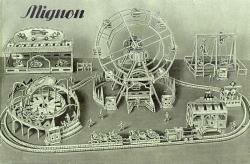 In post-WWII Europe, a new metal construction toy system bearing the name Mignon first appeared. These unique building sets were produced in French occupied Germany from about 1945 until 1953-54. Strong competition from established brands like Marklin and Meccano coupled with economic factors and patent conflicts contributed to a short lifespan for the system. 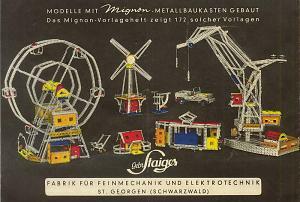 Today, due to their relative scarcity and unique, elegant part design, Mignon construction sets are highly sought after by metal construction toy aficionados around the world. Mignon constructions sets were manufactured by the Gebr. Straiger (Straiger Brothers) company in the city of St. Georgen in the Black Forest. Staiger had been in business in Germany since the early part of the century, and during the War years it was known for producing fine mechanical and electrotechnical equipment, among other things. After the War, with its normal raw materials in short supply, Staiger was provided with a supply of metal by the French government. The metal stock, much of it in the form of thin strips and sheets of aluminum, was earmarked for the purpose of building toys for export to France and for sale in shops throughout French-occupied Germany. Werner Staiger, one of the company's owners, decided to manufacture metal construction sets. He chose to market the sets under the name Mignon, a French word meaning "small" or "nice". (Over roughly the same short time period, Staiger also manufactured and sold a line of model trains under the same Mignon name). The small but elaborate Mignon product line consisted of only six items: three different building sets (Nos. 1-3), two supplementary sets (Nos. 1z and 2z), and one accessory clockwork motor kit (No. 250). Mignon sets were notable for their attractive cover art and their colorful, uniquely designed aluminum parts. In addition, the Mignon system was based on 6 mm hole spacing, making its parts less than half the size of those in most other systems of the time (Meccano and Marlin, for example, were 12.7 mm , or ½", systems). 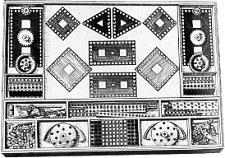 However, although the number of sets was limited, the number of parts was not: the system included a wide variety of different part types, 150 in all (see the Mignon Set Inventories here). The No. 1 set contained 300 parts, the No.2 had 622 parts, and the big No. 3 contained 1447 parts. The No. 3 set, shown below, was apparently only made during the later production years. You can see this amazing set in more detail in my special feature here. 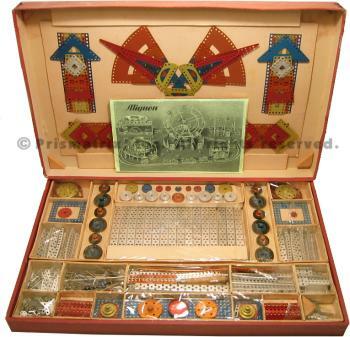 All Mignon sets were packed in low, flat boxes made from heavy cardboard. The boxes featured a single lower tray (made from a particularly dense board) that was divided by permanent partitions into a variety of individual compartments in which the parts were arranged. 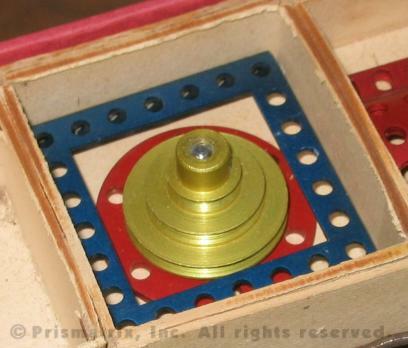 Some parts were left loose, some were stacked neatly in one or more layers (e.g., curved U-girders), and still others were held in place on cardboard inserts (e.g., gears and wheels). 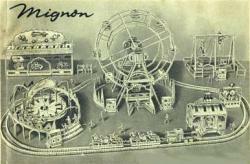 The slip-on box lids featured an attractive full color illustration on the top depicting a Mignon model amusement park. An added feature of the No. 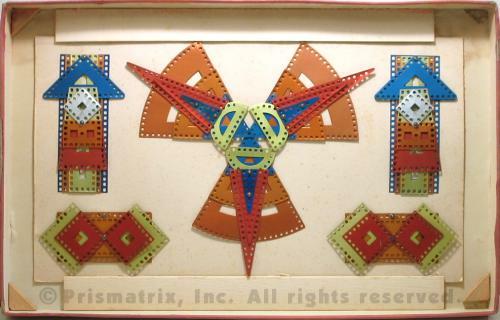 3 set was a large removable insert on the inside of the box lid that held an eye-catching arrangement of brightly colored anodized plates in a variety of shapes and colors (see above). Mignon instruction manual cover. This same illustration appears in full color on the cover of the box. Note the two different logo styles. As I noted earlier, there were five different numbered construction sets in the Mignon product line: regular building sets 1-3, and supplemental building sets 1z and 2z. The purpose of the supplemental sets was to upgrade each of the regular numbered sets to the next higher number. For example, set No. 1 plus supplemental set No. 1z was the equivalent of set No. 2. 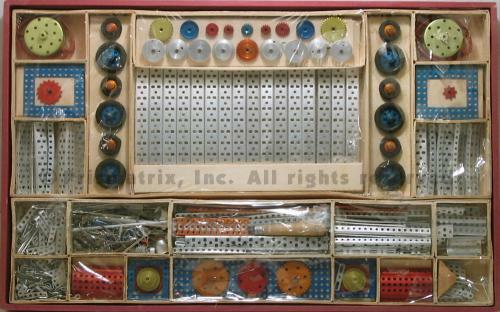 All sets featured uniquely designed aluminum parts, many of which were anodized in a variety of bright colors. The largest set, the top-of-the-line No. 3, is the subject of this feature. The photo at right shows the complete contents of set No. 3. Like all Mignon sets, it came packed in a flat, heavy cardboard box with attractive, brightly printed art on the cover. The box measured 21¼" x 13¾" x 1¾", and the set weighed in at close to 7 pounds. Inside, the parts were arranged - in a single layer - in a series of compartments, some with inserts to support and secure the parts they contained. The set included a total of 1447 parts in over 150 different styles. As previously mentioned, the vast majority of these parts were made from aluminum. This, along with the unique design of the parts and the small scale of the system (based on 6 mm hole spacing), served to set Mignon apart from other systems. The photos below show the layout of the set in detail. To accommodate the large number of plates of various shapes and sizes, the box features a large removable insert on the inside of the box lid. 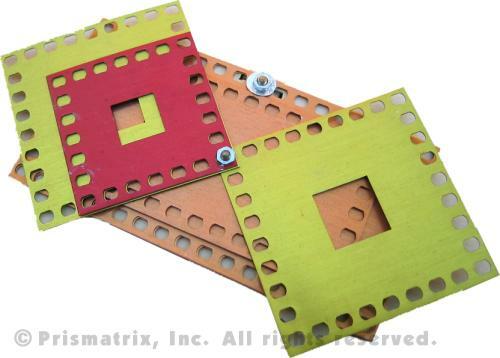 The plates are stacked together in various arrangements and attached to the insert with screws and nuts. The set shown in the photos above is complete and still factory sealed. The aluminum parts show no sign of their age, but after fifty years the clear cellophane covering the part trays and compartments is so brittle that it has cracked and split in many places. The only parts not visible in the photos are the screws and nuts, which are stored in shallow boxes located near the upper corners of the box beneath the two blue rectangular plates. You can take a closer look at some of the parts here. The Mignon instruction manual contained approximately 100 pages, with some very elaborate and complex models appearing in the No. 3 section (see below). The manual cover featured a two-color version of the same illustration used on the box lid. As I have discussed elsewhere on this site, many metal construction toy systems that have appeared over the years were inspired by the originator, Meccano, invented in England in 1901 by Frank Hornby. 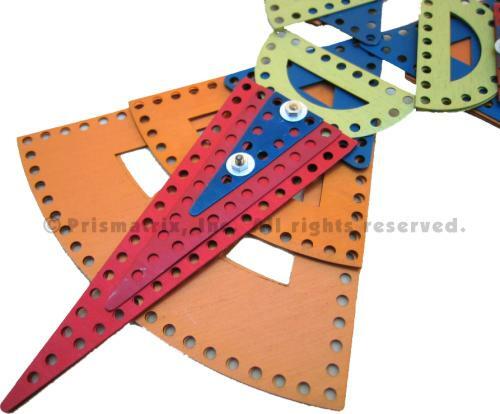 Systems like Marklin Metall and Temsi closely imitated Meccano's format. Others, like A.C. Gilbert's Erector, took their own form. Mignon falls into the latter category. The Mignon system contained 150 different parts, the vast majority of which were manufactured from aluminum. 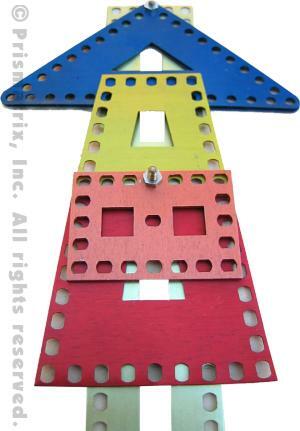 Many of these were anodized in a variety of bright colors, including red, yellow, orange, and blue. In addition, many of the parts came in unique forms, including circle segments, trapezoids, and triangles of various shapes. These features alone were enough to set Mignon apart from most of the other systems of the time, but there was another difference: scale. 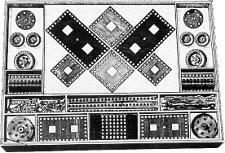 Most other systems were based on hole spacing that was either exactly or very nearly ½. Mignon was much smaller, the parts having a hole spacing of only 6 mm. The full specifications of the system are shown in the table below. 25-hole curved U-girders, a signature Mignon part; a 13-hole version is also part of the inventory. Note the pattern of both round and oblong holes. The single motor in the Mignon system, a feather spring clockwork motor, was only available in a special accessory kit. To see the complete Mignon set inventories, click the button below. The three photos above show an assortment of plates from the No. 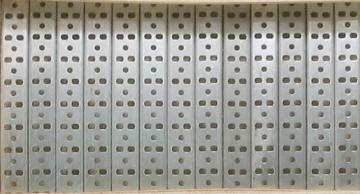 3 set as they were arranged and bolted to the lid insert. Some of the gears and wheels from the No. 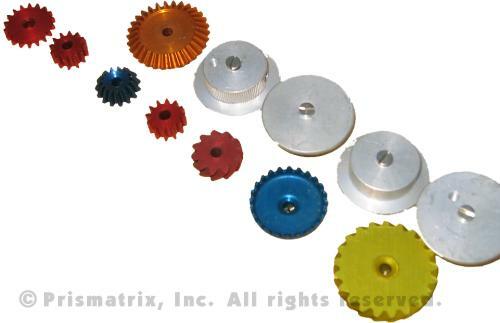 3 set; note the special helical gears.